Gosh, D major is pitching it high. It's usually in C, B flat or even A.
I call infringement. They've just relabeled the score to John Cage's 4'33", though Cage wrote it in 4/4. But who can hear the difference? @David Morris, I thought so too, but scouring the web for autographs and looking at the German Wikipedia page has shown me otherwise. I knew that it was written for guitar originally, but really? D major? In any case, a silent music score shouldn't need neither key nor time signature. But if 4'33" has a time sig, it really really needs a tempo indication. 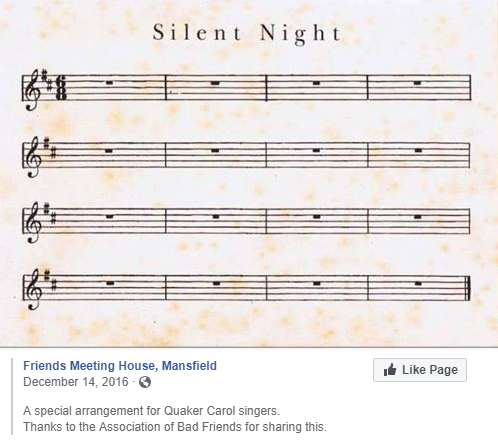 As a long-time Friend (and long-dusty holder of a Doctorate of Linguistics), not to mention an active card-carrying member of the Association of Bad Friends, I sit in expectant waiting to discern lyrics for this carol. While I have a good a laugh, of course. Surely the time signature should be 3/4. 6/8 is a jig. There are myriad non-jig 6/8 compositions. Think of each measure in Stille Nacht as having two beats, each divided into three pulses; the second set of pulses is softer than the first. ONE-2-3, two-2-3…. In the Quaker tradition, I'll shut up now. I was vaguely aware that the original was in D because of the guitar accompaniment, but cannot recall seeing an arrangement in that key in 40+ years. The first ten arrangements I found for voice or choir online are one in G, one in A flat, two in A, three in B flat and three in C.
Anyone thinking that D major's a bit high: in Gruber's original setting, the tune is slightly different from the one used nowadays. In particular the penultimate line doesn't go up to the fourth degree (G, in D major). This makes it a little easier for the sopranos — their part's highest note is F#. For those for whom F# is too high, there is an alto line. What notes the tenors and basses were to sing the manuscript doesn't say. The same notes an octave lower, perhaps. Another factor is that the pitch standard in Arnsdorf 200 years ago might not have been anything like our familiar A=440. And guitars are easy to tune. Cliff — the original was amusing, but your "Bauhaus" offering is even better. Thank you ! My wife, though not formally a Quaker, often Friends meetings at the meeting house just down the block from us. She owns a Quaker hymnal titled "Worship in Song" and it has actual notes and words and everything. This is by far my favorite version of this carol. Enough with the revisionist spreading of major jolly moods! It's obviously meant to be played in B minor, in a clear as night reference to BWV 232. I have a concern about measure 11. And is there a 4-bar intro, or a 4-bar playout? This should be played on an air guitar, of course. @Roger: What's your concern? I can't see anything wrong with it. Stephen: This should be played on an air guitar, of course. I trust everyone who's interested knows that YouTube has videos of "4:33" played by various ensembles, including death-metal band. @David Morris. Neither. Those shepherds had the blues. What's your concern? I can't see anything wrong with it. "I have a concern about something" is Quaker terminology for "the Spirit is moving me to do something". Today's challenge – sing "Silent night" over the backing for "Watermelon man"